Ryan has a job, which requires Internet and phone connectivity wherever we happen to roam. As a result of this and my wireless ISP experience, we have sifted through most of the available consumer communications gadgets, gizmos and systems currently available. 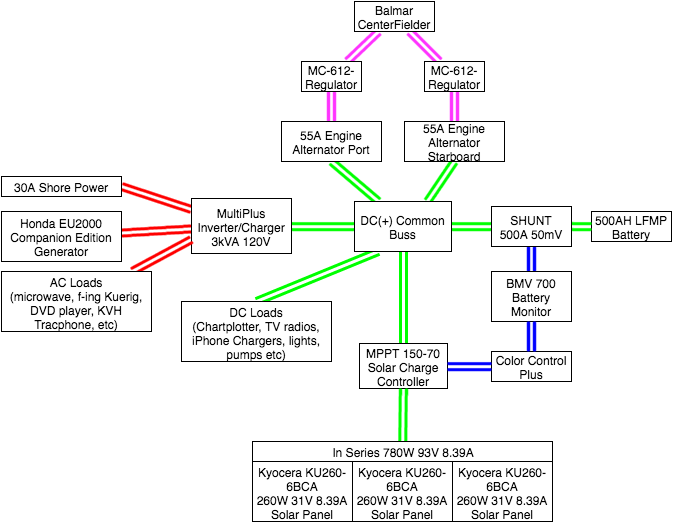 Here is a run-down of what communications devices we have aboard Waponi Woo, what they are supposed to do and how we use them. Waponi Woo came with a Uniden UM525 VHF radio. A nice feature of this radio is Digital selective calling, or DSC, so we can hail other boats directly. As most of you with a boat already know, VHF works pretty well for line-of-site, short-range calling. We rarely turn our VHF off. 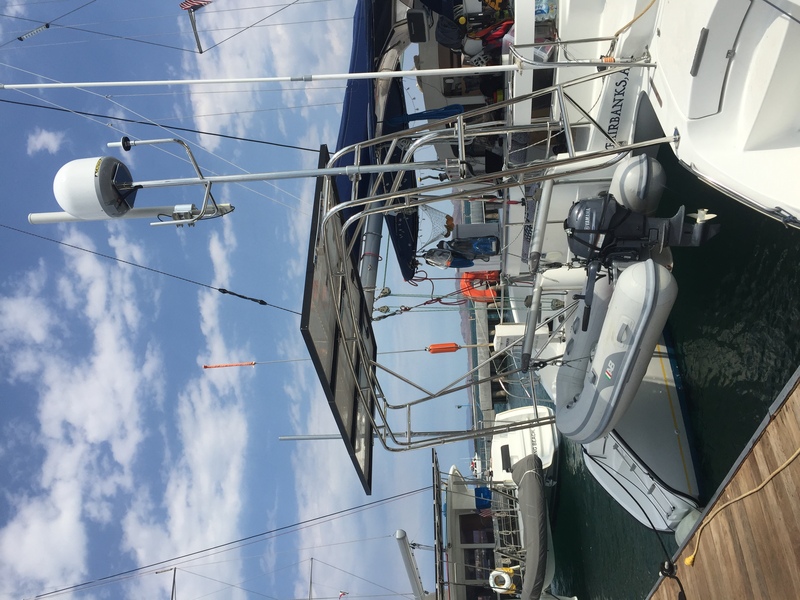 In La Paz, and many other cruiser infested ports and anchorages, one can hail other boats on a designated “cruiser hailing channel.” There are also a few VHF cruiser nets in the morning at the larger ports. VHF is a party line, so anyone can listen. 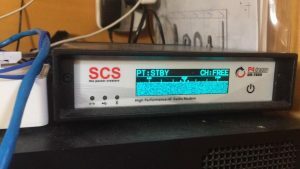 DSC makes it a little more difficult for those poised at their radios waiting to catch some juicy gossip to figure out what channel you are talking on. We have 2 handheld VHF radios as well; one with DSC and one without. One has DSC so we can call India and the handheld rings like a phone. These are both waterproof and float. We use them when we go to shore or for dinghy rides. We have two so we can give one to India and take one with us if we go separate ways. You don’t want to be that guy standing on shore waving your arms trying to get someone’s attention. Marina de La Paz has 100mbps Ethernet wired to each slip. This is included in your slip fees. The only thing you have to purchase is a cable with the waterproof connector the marina requires you to use. (You can purchase the connector and make your own cable if you have the means to do so) This connection is pretty sweet; it is also in Mexico. Why is this important? Netflix. Hulu. Pandora. Spotify. Google Account Security. Apple Account Security. Streaming media services pay for the rights to stream content in a specific country. Once your phone/computer/tablet figures out it is no longer in the United States you will start getting messages saying content and/or services are not available in your region. Google and Apple will also want to verify it is, indeed, you trying to log into your e-mail or cloud storage from a foreign country and will ask you to re-enter all of your passwords. For some, this isn’t a big deal. For us, it is a bit of a pain. To remedy this, we use a VPN back to the States. Many other cruisers do this mostly to watch Netflix. A quick note on passwords and two-factor authentication (TFA): Many banks and services such as iTunes will send you a text message to verify your identity. This becomes an issue when you have a Mexican SIM card in your phone and can no longer receive messages to your US cell number. To remedy this you may wish to disable TFA while you are outside of the US. An example of why this can be a pain… A fellow cruiser wanted to buy Navionics on his iPad. iTunes had him log in and wanted to send him a text message to verify his identity before proceeding with the transaction. Unfortunately, his US cell number was no longer active. This created a stressful situation, which could have been avoided. Luckily, his 11-year-old son was able to login to his iTunes account with no TFA and purchase the software. 3G and 4G (LTE) is available in most populated areas. The coverage areas are continuously expanding as people rely more and more on cellular communications. There are many anchorages around La Paz with strong cell service. Between Port Townsend and San Diego, there were only a few places we had zero connectivity while we were within a reasonable distance to shore. If you are planning on keeping your US cell carrier, you will want to make sure your plan covers you in Mexico or wherever your travels are taking you. Keep in mind, while your plan may include service in Mexico, it is designed for people vacationing. After several months of use, your carrier (I am looking you T-Mobile) may cancel your service for excessive roaming. Unless you go to the States often, you may want to consider getting a local carrier SIM for your phone. In Mexico, Telcel is the major cellular provider. They have data plans, which are extremely reasonable compared to the US and they do not restrict tethering. Here is a simple “AmigoPlan” you can purchase; we have a Telcel SIM card for data in our iPad with one of these plans. When we are away from the marina, but have cell service we plug our iPad into a Mikrotik router for basic connectivity. We extend this reach with a SureCall cellular booster/repeater. The repeater’s antenna is mounted to the top of the mast. We bring our own cell tower wherever we go. 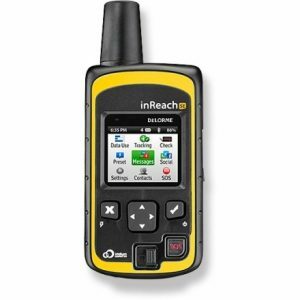 The Delorme InReach (now owned by Garmin) uses the Iridium Satellite system for sending data around the globe. It will work from pole to pole. We have the RAM mount charger suctioned to the salon window. This device is always on and charging. There is a monthly service fee to keep this device active. We have the unlimited plan so our progress is tracked up to every ten minutes and we don’t have to count our text messages. This is India’s device to communicate with her friends when she has to go for days without cell service (OMG I can’t even). It was also required for the CoHo Ho-Ho sailing rally. The device tracks by sending out “pings” after we tell the device to start tracking. We can then share our location here: http://share.delorme.com/waponiwoo. This is a wonderful feature for concerned parents and friends. This is a fixed device communicating with moving satellites. This means the device has to wait for a satellite to pass overhead before it can send or receive a message. In practice it can take up to twenty minutes to send or receive a message. This is not an instant gratification device. You can send messages from one inReach device to another inReach device without any issues. Your mom, unless she is traveling with you, will need to be “whitelisted” before she can send a message to your inReach. For some of you, this may be considered a feature. If you aren’t in that group, you will need to send an initial welcome message to any non-inReach devices you want communicate with your inReach. You can connect your inReach via Bluetooth to your iPhone or Android device. Unless you are feeling nostalgic for the days of T-9 Word, we recommend doing this. Ryan has our Delorme (now Garmin) pretty tricked out. We get all of the monitoring alerts for my business with it so I will always know if something is wrong. Ryan’s managers and co-workers have access to it should he need to get a message from them and family and friends have access as well. We also have a secret web page with a form that you can send us messages with. This is the Kodak DC3800 of satellite communications for consumers. It is the first generation of affordable, all-in-one, consumer-friendly, WiFi enabled, satellite communications devices on the market. There is better stuff out there, but the price point still makes other systems impractical for those without a business need. The IridiumGO! also uses the Iridium satellite system so will work anywhere in the world. 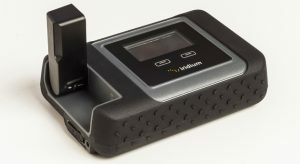 It is a small hotspot which allows you to use specialized apps designed for the IridiumGO!. Surf the web… slowly… very, very, slowly… Do you remember NCSA Mosaic? Do you remember waiting hours for an image to load? Think back to those days. This blog post would take about 45 minutes to load with no images. Can you surf Facebook? Yes, while finishing War and Peace. A data file that is around 50KB will take 15-20 MINUTES to download. Make phone calls… sort of. Ryan and I both spent time as kids in Alaska in the seventies and remember long delays when calling grandparents in the lower 48. Calls on this device are similar. You have to remember to give ample time for your speech to travel up to the satellite and back down to Earth. There is a lot of echo. We have also found calls with device tend deteriorate and disconnect within 5 to 6 minutes. It will work in an emergency, but I wouldn’t plan on using it to have long talks with mom. E-mail: Iridium does provide an e-mail service, which is only accessible via your Iridium device. We recommend using this trick to keep mail messages sent to your Iridium mail account from clogging up the system: http://www.outfittersatellite.com/blog/iridium-go/iridium-go-email.html Remember, a simple email can take 20 minutes to send. A picture, after it is down sampled enough to resemble a 60 Minutes anonymous interview, can take 45+ minutes to send. PredictWind Offshore: We use this to update our weather when we are out of cellular or WiFi range. It will take about 10 minutes to load with weather routing from either the iPad App or the Macbook App. Tracking: We haven’t used this feature because it is so easy with the InReach; you set it and forget it. On the IridiumGO! you have to go through a manual process to send tracking data. If you get the IridiumGo!, make darn sure you get the external antenna. It makes it 10X more reliable and almost 3X faster. This is also a fixed device communicated with moving satellites. A colleague of ours works in the sat-com business. He said this recently: The current Iridium network is not really 9600 baud, it’s quoted as 9600 because that’s a theoretical speed you can achieve if transferring a v42bis compressed text file at 2400 bps. Basically the same as BBS dial-up with a good quality US Robotics modem at 2400 baud if you download a pure ASCII text file. The IridiumGo! is also a monthly or minutes-based subscription service. 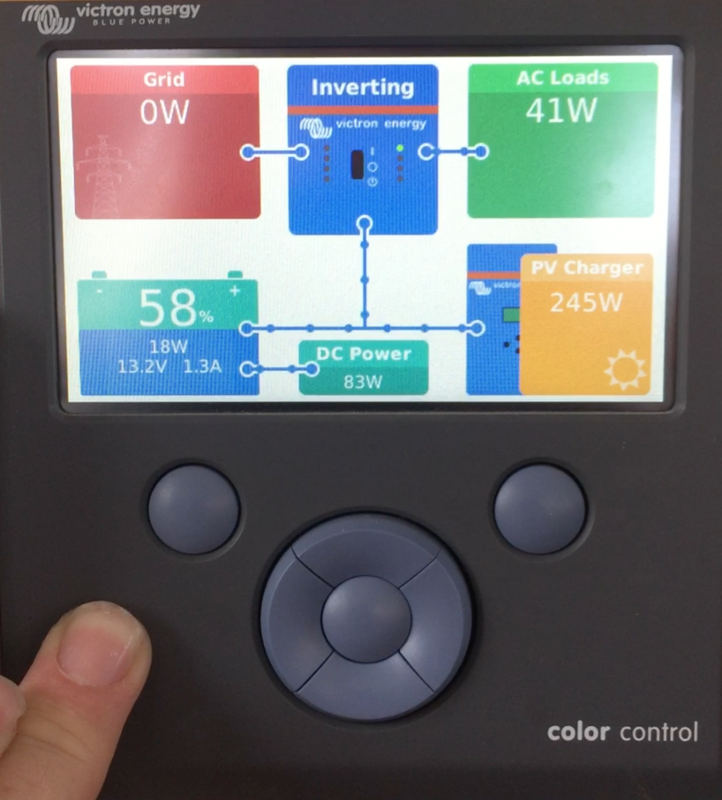 If you don’t have an Single Side Band or High Frequency radio, we recommend getting one just for the fact that you don’t really have ongoing costs after the initial installation. The Waponi Woo came with an SSB pre-installed so we did not have to go through the process of installing one ourselves. There are global cruiser nets around the world, which will enable you to communicate and connect with other cruisers in your area. We have an iCom IC-M802 which we really just tinkered with it until the Baja Ha-Ha. 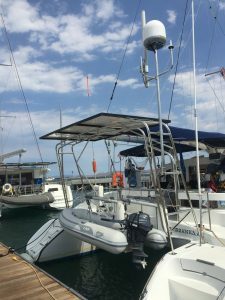 The Ha-Ha uses the SSB to check in after the fleet spreads out beyond VHF range and, to be honest, we had to grab our SSB for idi-yachts book to tune in the first day. This year the Ha-Ha is requiring either an SSB or a satellite messaging device such as the InReach or the IridiumGO! In addition to the traditional applications of the SSB, we have a Pactor 4 modem, which can be used to send emails and receive weather faxes at less than 2400baud. Weather fax are received passively on your PC; you can just set it up and let run without using too much power. What you get are black and white “faxes” of raw weather data. It can be a lot to sift through. You can also use an iPhone app with a speaker or specialized cable to get this data without a modem. At this time, we haven’t used the Pactor for sailmail. It was too proprietary for our applications. Sailmail’s subscription service can also be used to get weather data sent to you at designated intervals. 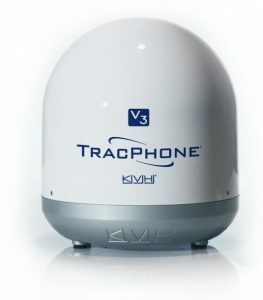 After crossing our fingers that one of the above devices designed for offshore use would be sufficient for Ryan to communicate with the office, we gave in and bought a KVH TracPhone V3-IP. 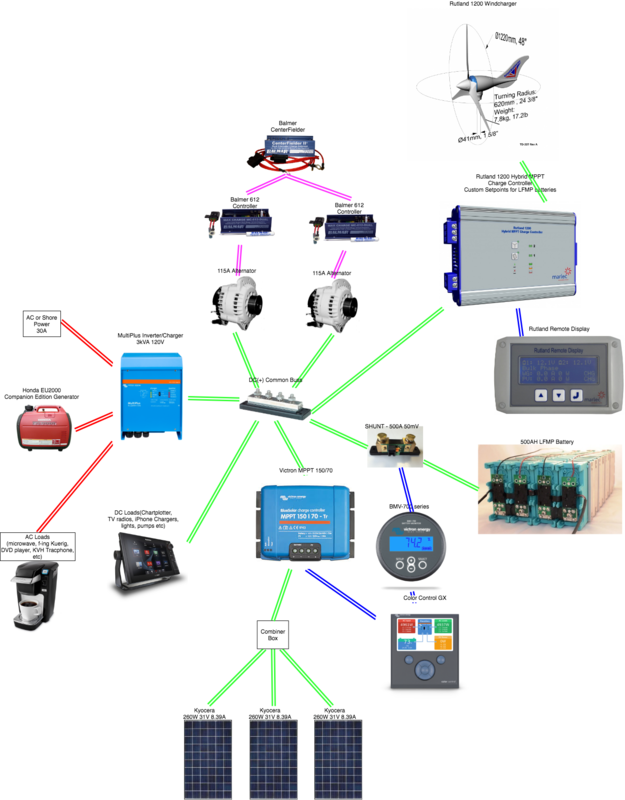 Everything above was effectively useless for real-time business communications. The KVH enables Ryan to have reliable, useable Internet and phone. Unlike the previous offshore devices, this is a moving device; it tracks the satellites as they orbit. This makes the user experience fairly seamless. This capability is also an electricity vacuum. The base unit guzzles 100+ watts of energy while it is powered on. 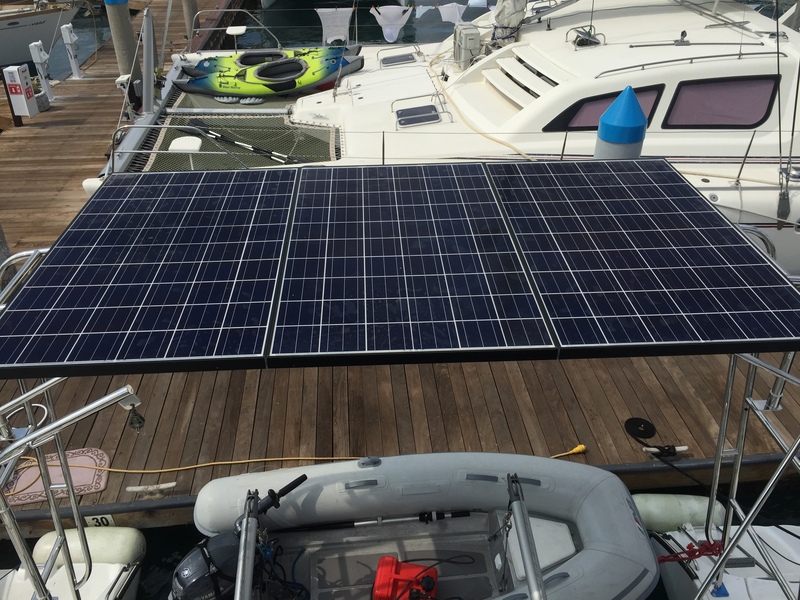 If you are in heavy seas, you have to have it powered on to prevent damage to the dish inside the dome. On the plus side, Ryan has used this system for two months now and is quite impressed. It has allowed us to stay out in remote areas while he works. He uses a Mikrotik router to tweak the connection to 64kbps and then only allow certain IP address ranges to go through it. In addition, it will only connect to an RDP session on a computer under a conference table at Ryan’s office. Even with all of that, he can still burn through 250MB in 1 week. This is NOT a web surfing device! India and I are not allowed to connect to it. Phone calls, at sixty cents per minute, are crystal clear on this device. It comes with a handset for calls; this is the phone to call mom on. Per minute, the phone is less expensive than the IridiumGO!. One thing you can do to improve your chances of a harmonious WiFi experience is to use a WiFi extender. There are many on the market and range quite a bit in price. We recommend the Ubiquiti Bullet in conjunction with a standard, residential router. In fact, one of the uber-expensive marine WiFi devices I saw at a boat show recently was simply a re-branded Ubiquiti Bullet. We will have an instruction sheet on how to get this set up shortly. This device puts out more power than the WiFi antenna in your computer and/or phone so can connect to devices on the other end with a weaker signal. It should improve the quality of the connection you have with whatever wireless access point you are attempting to connect to. A WiFi extender will not increase the available bandwidth. Your connection to the access point may allow for 500mbps but if the connection from the access point to the rest of the Internet is only 20mbps, you are limited to 20mbps. You are most likely sharing that 20mbps with 30 other people as well and they all want to stream Netflix and update their chart plotter. When public WiFi works, it is great but I would not rely on marina WiFi for real-time business due to the variables listed above. 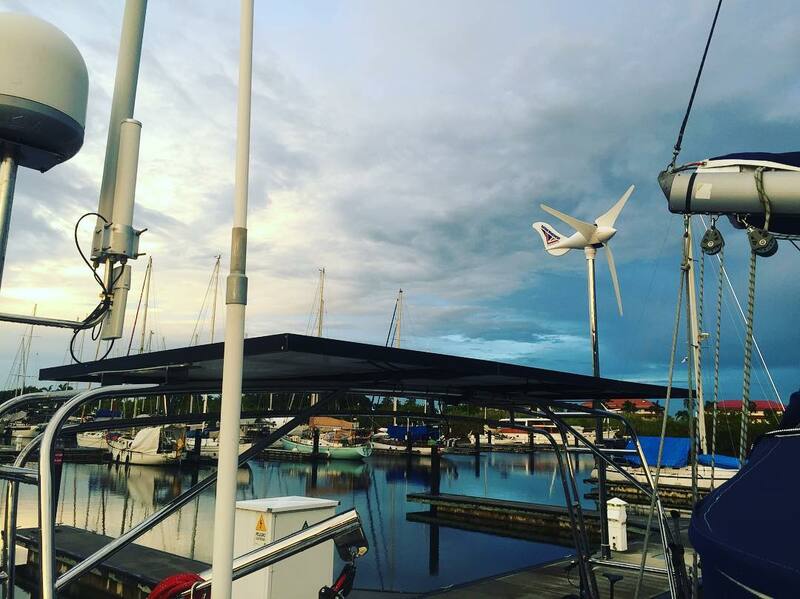 A WiFi extender will increase your chances of picking up the WiFi from the hotel or café on shore while you are on the hook. 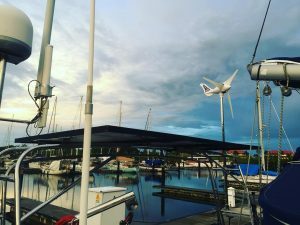 Before you leave your vessel, take a look at the available WiFi networks, choose the establishment with the best signal strength and go contribute to the local economy. Take a trip to shore, grab a beer and get the WiFi password. We like to take a photo of it with our phones so we don’t forget it. 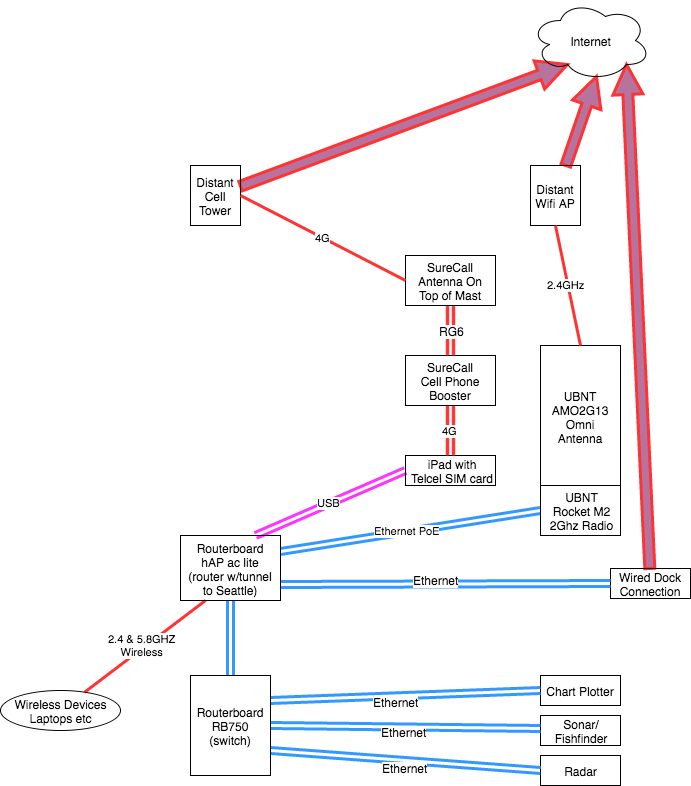 A quick and dirty network map of Waponi Woo. 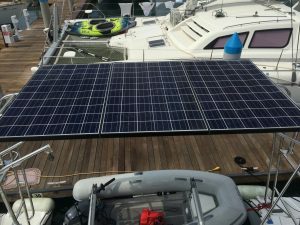 This entry was posted in Geek Posts and tagged communications, technology on May 27, 2017 by admin.